Drawing directly from the experience of seafarers, the E.U.-funded project CASCADe has developed new adaptive bridge displays and design methodologies that treat humans and electronic equipment as parts of a cooperative system. To date, the development of ship bridge systems is characterized by being non-harmonious and far from guaranteed to be of optimal design for the actual users of them. Existing regulations for system and procedure design are disconnected and defined on a level which is not informative for bridge design. Research has shown clearly, that in many cases, accidents and incidents were caused by human error due to non-optimal design of the human-machine interaction leading to degraded situation awareness. CASCADe addressed the design of bridges as an integrated whole with holistic perspective that allowed the detection and solving of potential conflicts including human error and inconsistencies and redundancies in the information presented on screens. Beside cognitive ergonomics, CASCADe also pays deep attention to physical ergonomics and to the interplay between physical postures, physical moves and cognitive behavior and communications on the bridge. The three-year project, which is coming to a close this month, then developed a set of adaptive bridge displays including a touch screen “Shared Display” intended to aid communication and co-operation on the bridge. This tool is fully customizable and allows one screen to show multiple sources of information in whatever configuration is most suitable for a particular situation. "It offers functionality to graphically annotate maps, leave notes for other crew members or complete checklists electronically." The “Shared Display” provides functionality to graphically annotate maps, leave notes for other crew members or complete checklists electronically. The CASCADe console was integrated with tools used by pilots in their Portable Pilot Units (PPUs). Firstly, CASCADe developed a protocol to share pilotage routes between the PPU and the ship’s electronic charts. Secondly, a link was established between the PPU and the bridge screens to allow mirroring of information from the PPU screen, enabling crew members to see extra information normally only available to the pilot. 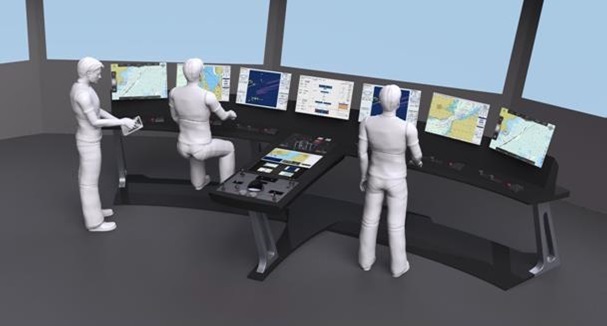 All of these CASCADe tools were tested on both a physical simulator (a ship simulator used for training) and a virtual simulator (a software-based simulation of a ship bridge). The virtual simulation platform made it possible to test new bridge designs at the earliest stages of development, based purely on computational models. The final evaluation of the CASCADe results took place in Kiel, Germany, late last year. The new ship bridge (including the handover and annotation tools) was presented to a group of nine local pilots, officers and cadets. The feedback was generally positive. Under the coordination of OFFIS (Oldenburg Research and Development Institute for Information Technology Tools and Systems), CASCADe included a consortium of seven project partners from five E.U. countries including BMT Group, Raytheon Anschuetz, Mastermind Shipmanagement, the University of Cardiff, Marimatech and Symbio Concepts & Products. Four further associated partners including the Maritime Cluster Northern Germany, Nautilus International, NSB Niederelbe Schiffahrtsgesellschaft mbH & Co. KG and the University of Tasmania also supported the project.